Hope everyone had a wonderful Thanksgiving filled with friends and family and other goodies to be thankful for. Lucas and I baked some fantastic pumpkin pies (If I do say so myself) to take over to my parents’ house and we celebrated our first Thanksgiving back in the states in three years. This, unfortunately, is the time of year that’s not a lot of fun posting-wise on my craft blog. Mostly because I’m hard at work on gifts for family and friends and… well… I can’t post some of them because I know that they will or might read my blog and then their gift is no longer a surprise. It’s hard because I get so excited when I finish a project and can’t wait to show it off, but alas… I must refrain. 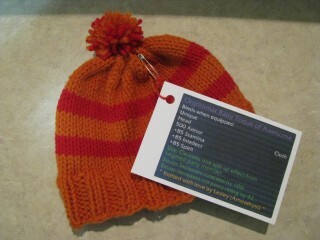 For example… today while hanging out with family I managed to finish another baby hat. This one was not for my nephew, however, and instead for some friends that play World of Warcraft, and who are about to have their first child any day now. They’re both awesome, and I wanted to make them a little something. 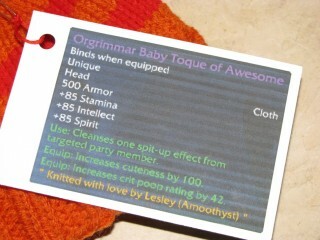 Wait, I said gifts completed that I can’t share on my blog, right? Whoops. Ok so the baby toque I could share because it wasn’t a surprise, but then later this evening after we got home from Thanksgiving festivities, I completed the gift I’ve been knitting for Lucas for Christmas. And THAT gift I can’t share here… yet. Just know that I’m soooo stoked that it turned out and proud of all the work that went into it that is now complete. And it looks fabulous.Â I’ll definitely share it after it’s gifted, though! Introducing the BABY Cthulhu Toque! 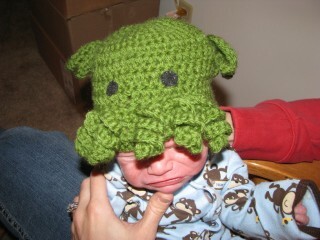 Newborn nephew Will sporting one of my ultra cool new baby Cthulhu Toques! It was only a matter of time before my crochet Cthulhu toques spawned pint-sized versions for children. Due to many requests, I finally sat down and put together the youth version of my pattern. I’m now selling child-sized Cthulhu toques in my shop AND am offering the youth pattern included in the same PDF as my original adult sized version… at no additional cost for the pattern!Â Now my Cthulhu toque pattern is like having 2 patterns in 1!Â Â You can either buy the pattern, which includes adult and child instructions OR you canÂ purchase adult or child-sized Cthulhu toques already handmade by me at The Pink Toque Shop. Just in time for the holidays! The new baby version of my Cthulhu Toque. Get yours now! As of the time of this writing, I’ve sent out a mass email to everyone who has purchased the Cthulhu toque pattern from me in the past via Etsy or Artfire and sent them a complimentary copy of the youth sized pattern update. Going forward, new purchases of the pattern from Etsy or Artfire will receive the updated PDF that includes both adult and youth pattern instructions. I also uploaded the new PDF toÂ Ravelry and sent out a mass message to those who had purchased it via RavelryÂ to get them the new copy.Â If I somehow missed you, please contact me immediately with your name and email so I can ensure you get the updated version! Adding youth sizing to my pattern is not the only update that I’ve made to my most recent version; I also updated the pattern to include tips and blocking instructions specific to the design to help you get the most out of the pattern and get it to look just right. 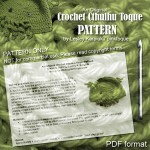 Want to buy the new and improved Cthulhu toque crochet pattern? Check it out in my Etsy shop!Â Want to buy pre-made Cthulhu toques already crocheted by me for yourself or a loved one? Get thee to the shop! Enjoy! And thanks for your business :) Hope you had a great weekend! My baby nephew is finally here! 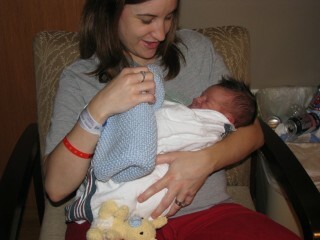 Little William was born last night at 11:14pm and weighed 7lbs, 15oz and was 22 inches long. He is the spitting image of my little brother, and so beautiful. I am so proud of my brother and sister-in-law, and everyone is healthy and doing well. 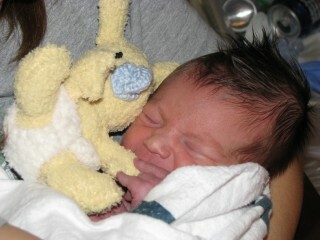 All I have for you with this announcement post is a precious, precious photo of Will hugging his first stuffed animal… a knitted bunny made by his Aunt Lesley :) Lucas also gave Will the wonderfully soft blanket that his uncle knitted just for him. Warning: these photos are full of cuteness. Don’t say I didn’t warn you. Welcome to the world, little nephew. I can’t wait to spoil you! I’m here for just a quick drive-by (or surf-by?) post to show off what I’m currently working on! On the needles today is a lovely lace-edged toque with my even more lovely Nova Scotia yarn that I purchased over the summer when I was in Halifax with Lucas celebrating our anniversary. I know this picture doesn’t do the yarn or the pattern justice (and I’m quickly learning that lace doesn’t look quite right until after it’s blocked) because I took it at work instead of at home with my good digital camera, but I think you get the idea. I’m finding the yarn to be just delicious — if you don’t remember, it’s the Tanis Fiber Arts yellow label DK weight yarn in Spearmint, and I purchased it at the Loop Craft Cafe in downtown Halifax. The color is gorgeous and the yarn is so nice to work with.Â It was my first hand-dyed hank of yarn and I don’t own a swift so Lucas and I did our best — it turned into a huge pile of mangled mess, but in the end we managed to get it wound into a cake. Whew! It was totally worth it. 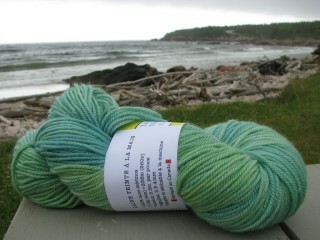 Tanis Fiber Arts yellow label DK weight in Spearmint, photo Ã‚Â© Lesley Karpiuk / pinktoque, taken on Cape Breton Island, Nova Scotia on the Cabot Trail. 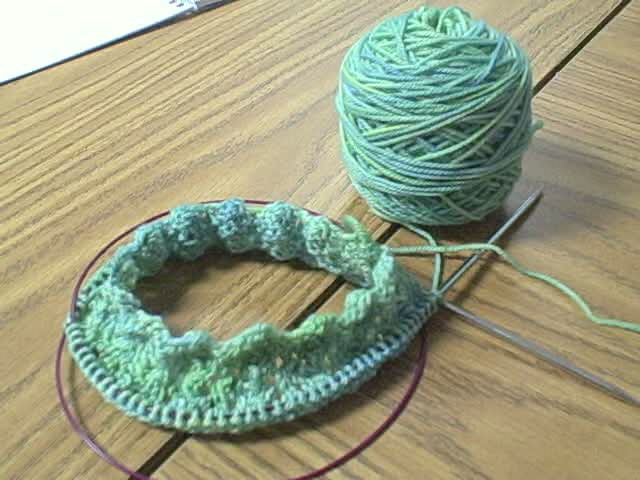 The pattern is the Lace-Edged Hat from Julie M. Hentz at Head Huggers, and I really think it’s turning out pretty. I featured it over on the Knitting Under the Desk blog last week, and my favorite part of the hat is that there’s enough excitement with the simple lacework for a brim instead of the typical ribbed brim to make the hat interesting, but enough stockinette to keep me in my comfort zone, too. The best part is that once you do all of the lacework, you’re home free, since it starts from the brim and works to the crown.Â I highly recommend it! I can’t wait to finish it and post a better photo of me wearing it. Also recently I’ve been working on a pattern en masse as Christmas presents for family and friends.Â Remember all of the jam? I’m also knitting Christmas ornaments to go along with the jam packages, so photos of that will be coming shortly. I’m nearly halfway finished on the lot! In RL news, my baby nephew is due any day now and Lucas and I are moving into a new place this weekend, so it’s a busy week! I can’t wait to meet my nephew and snap some photos of the baby things I’ve knitted for him over the last several months. You can be sure photos will follow :) Take care! My Memories Suite Halloween Deal! 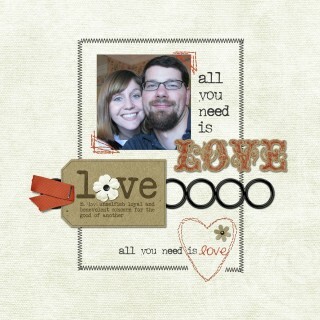 You all know how much I love Polariod’s My Memories Suite digital scrapbooking software. I just wanted to let you know about their great deal for Halloween; check it out! If you’ve been waiting to purchase My Memories Suite, now is the time to grab it at a fantastic price just in time to scrap those precious Halloween memories. Need some guidance along the way? Get even more support from the Facebook Fan Page for My Memories Suite where they share ideas and show off scrapbooking pages and have contests! Don’t wait! Check out My Memories Suite today; I know you’ll love scrapping memories with it as much as I do :) Happy Halloween! Well… I take that back. 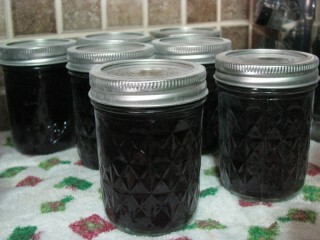 Ok, so we did make some no-sugar-added blueberry jam this weekend to complete our jammin’ adventure with 24 jars! 10 jars of peach, 7 jars of grape, and 7 jars of blueberry. That means plenty to send off to family and friends as gifts this season and plenty leftover for me to pair with peanut butter for lunch. It’s getting chilly out and I can smell Fall again. This normally wouldn’t be so extraordinary except I’ve lived without a true Fall for the past three years. I had almost forgotten my favorite season; Calgary’s summers usually crash landed right into Winter, and I realized this past week that I really missed the season of cooler sweatshirt-and-long-sleeved weather with beautifully changing golden and red leaves everywhere.Â That little nip in the air along with a fresh hockey and football season has brought back one of my favorite things about Fall; cuddling on the couch watching [insert hockey or football game here] while I knit. I recently have had a lot of Cthulhu Toque orders crop up, and I realized that it’s probably due to the cooler weather rolling in. It’s about time to start thinking about toques and scarves and all of that gets me energized to pull out the yarn and needles (or hooks) and get to work. 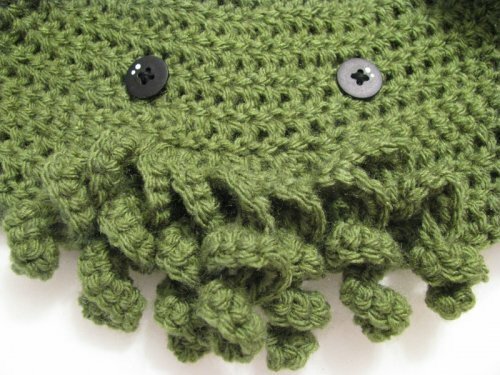 Speaking of my Cthulhu Toques, I’ve got plans in the making for a toddler sized (due mostly to the several requests I’ve received) version as well as a few other little surprises. I just hope I can find enough time in the day to make and do all of the little creative plans I’ve got in mind AND get a head start on my Christmas gift knitting. Stay tuned! This go around we decided to try making a peach jam. 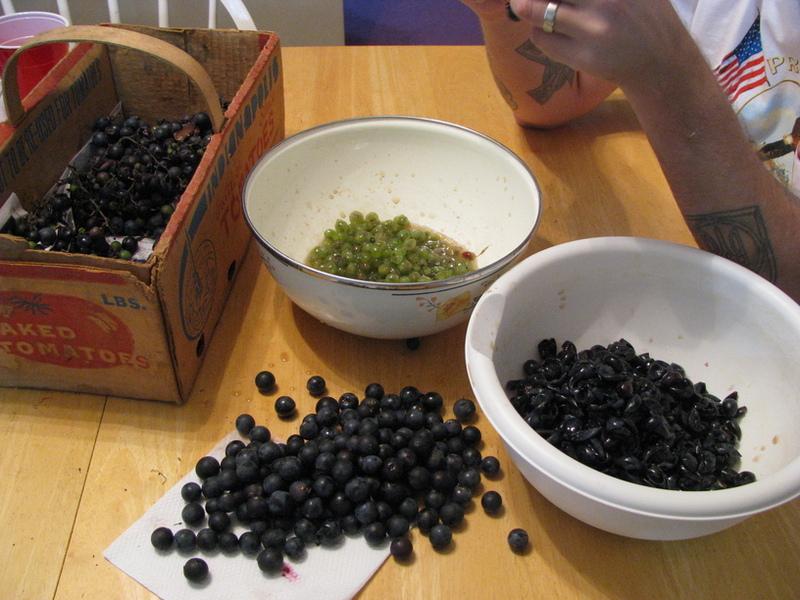 A few weeks back when we made concord grape jam we used fresh grapes from my grandma’s garden. Since we didn’t know anyone who had fresh peaches in the area, we just picked up some *gasp* frozen unsweetened 100% peaches at the grocery store. Yes, we’re lame I guess, but we were itching to can more jam and the produce section wasn’t looking too… healthy today. 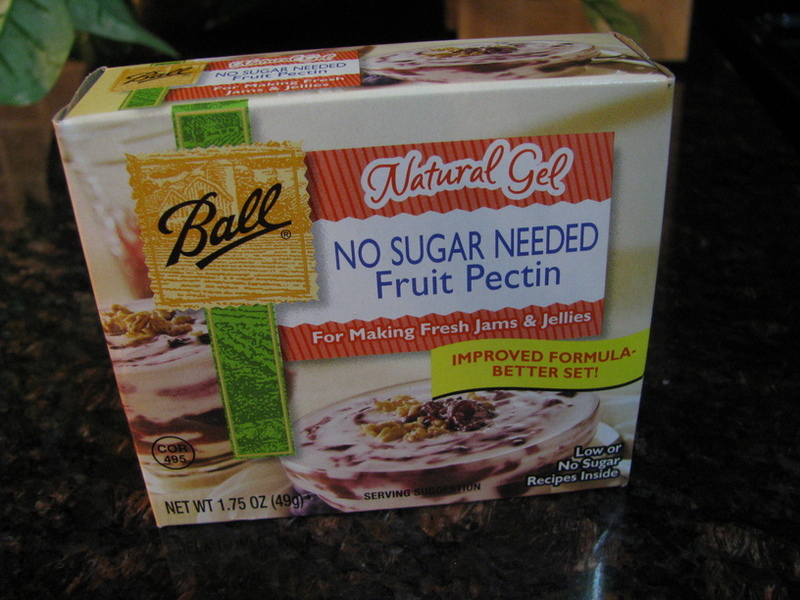 Once again we used the SUREJELL brand of low sugar/no sugar pectin and combined the recipes and tips we found on various websites online to comeÃ‚Â up with what we thought would make the best peach jam. We used four pounds of frozen peaches, which we thawed completely, and 2 cups of white grape peach juice for sweetener instead of sugar. After a little help from the food processor and some hand blender thing we found in my mom’s cabinet, we threw all of the peach goop and juice onto the stove to boil. 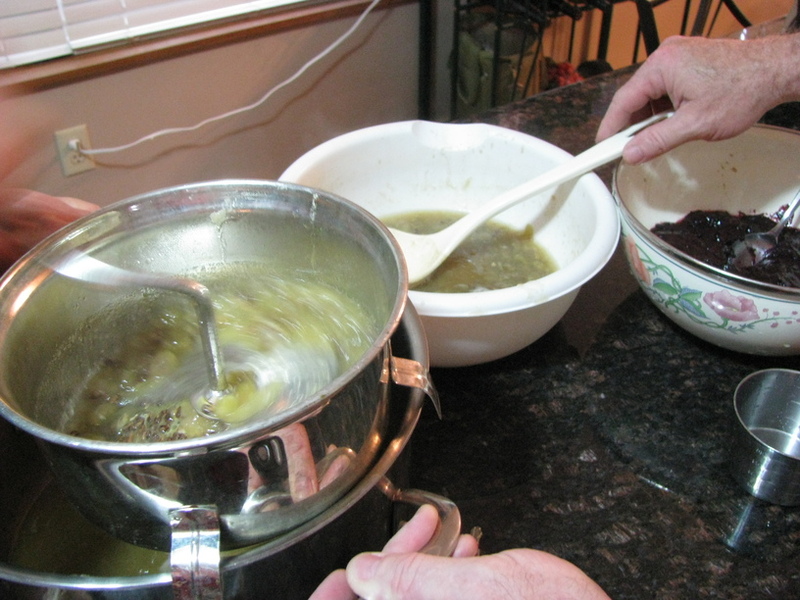 Once we got a rolling boil going, we added in the pectin and 1/4 cup of Splenda. That really was it. So far so good and all 10 jars we managed to get from it sealed properly. Now we’ve got 17 jars of fresh jam between the grape and peach to give away as part of our Christmas gift packages we’re doing for family and friends this year. Awesome! Also today I finished yet another knitted object for my upcoming nephew — can you believe that he’s due at the end of this month?! 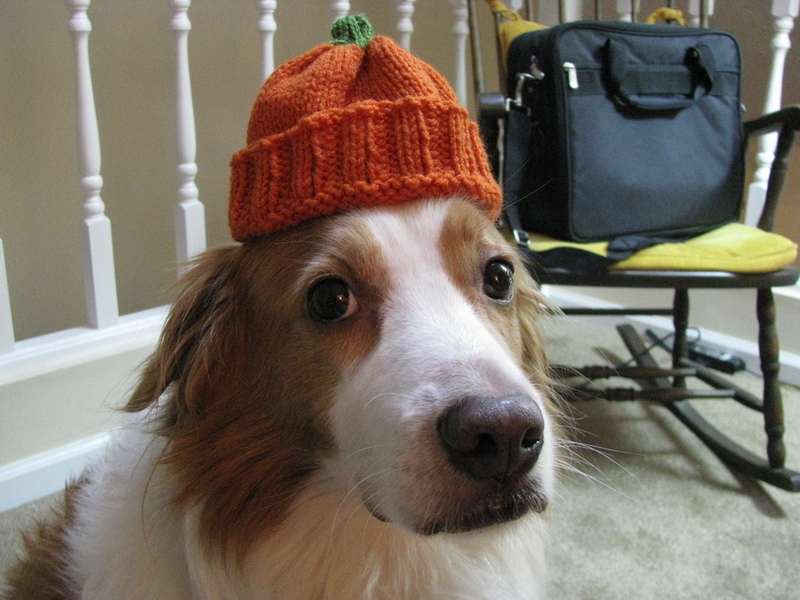 In true fall style I whipped up a pumpkin toque and figure that even if he’s born after Halloween that the pumpkin would be an appropriate icon for the in-between Halloween and Thanksgiving period. I hear my brother and sister-in-law aren’t big fans of hats that look like vegetables, fruits, or flowers… too bad for them, eh? Since baby William isn’t here yet, I used (big surprise) Oliver and Winston as models. I think the toque turned out pretty darn cute, don’t you? Finally, an update! A few weeks ago, my grandma convinced Lucas and I that we needed to try canning. 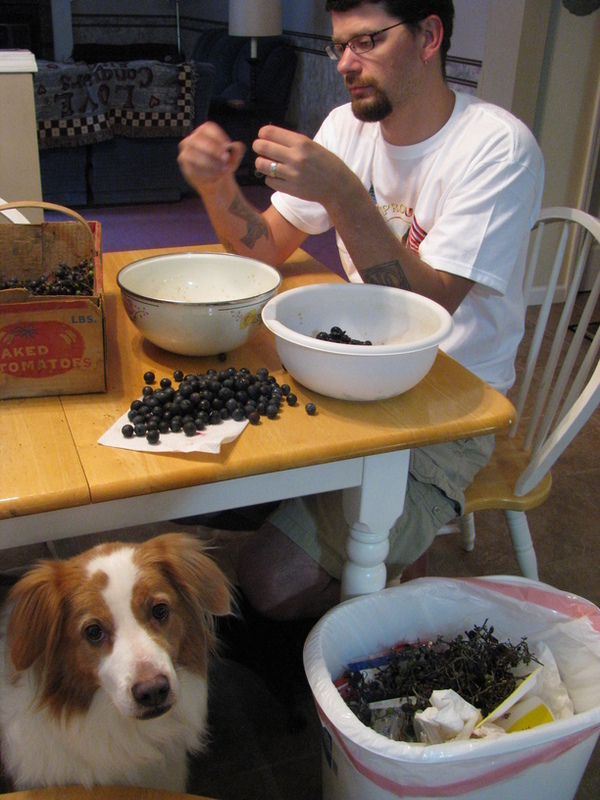 Her grapes ripened well and yesterday afternoon we went over and took a nice hefty load of concords off her hands. She ensured us that it would be easy, and after a little pre-canning prepÃ‚Â readingÃ‚Â online, the whole process really was easy.Ã‚Â And dare I say… fun? Looks like we’ll be gifting some jam this holiday season. *note: if re-using jars from previous canning sessions, it’s recommended to always buy brand new lids. (Just the flat lid part only, not the screw bands.) You can easily purchase these separately at most grocery stores or other big box stores like Meijer or Wal-Mart. Throw your jars and 2-part lids into the dishwasher to wash them thoroughly. Be sure to turn on a sani-dry or drying process to the cycle; this ensures the jars are nice and hot and dry at the end, which is suitable for hot jam. 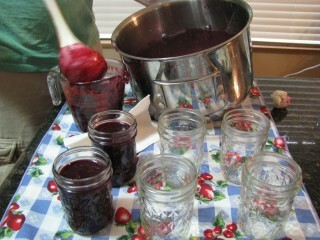 The jars need to be hot when you pour the hot jam into them so that they don’t break from the temperature difference. Using your dishwasher (if you have one) eliminates the need for hot water to keep the jars warm in while you prepare the jam. Alternately you can wash the jars and lids by hand with soap and water and then keep them in warm (not boiling) water until you’re ready to fill them. While you should keep the jars and flat lids warm until use, keep the screw bands separate and cool to make closing up your hot jars later a little easier. 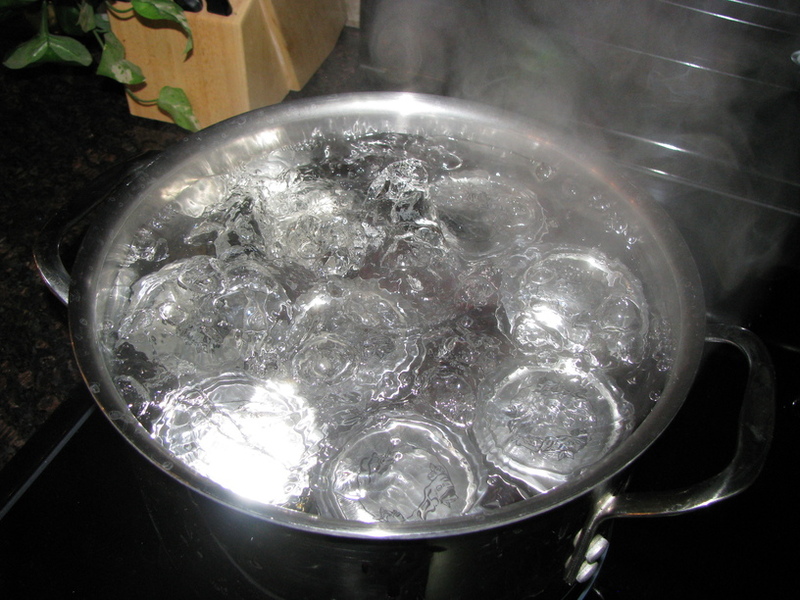 You don’t want the water to boil because boiling the flat lid before using it to create a seal may warp them and not allow them to seal properly later. Slip the skins from the grapes, separating the pulp from the skins. Toss the skins into a food processor and blend; set aside. Combine grape pulp and white grape juice in a saucepan and bring to boil; cover and simmer for 5 minutes. Toss the cooked pulp through a Foley press or run through a sieve to remove the seeds. Now combine the skins and pulp in a big bowl; this is considered “prepared fruit.” Measure exactly 7 cups of prepared fruit into a large 8 quart saucepot and put it back on the heat. Mix the 1/4 cup of Splenda and pectin in a small bowl. Add it to the fruit in saucepot; stir to mix well. OPTIONALLY you can add 1/2 tsp. of butter to reduce foaming, if you have any foaming. Bring the fruit to a full rolling boil on high heat and boil for 1 minute, stirring constantly. Remove from the heat and skim off any foam if necessary. The dishwasher cycle should be complete; pull the hot, dry jars from the dishwasher and place on a towel on the counter. 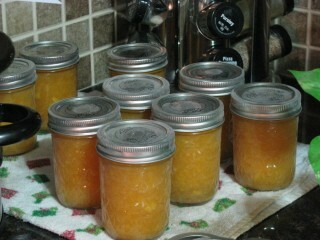 Ladle the fruit into the prepared jars, filling to within 1/4 inch of the top. Wipe the jar rims and threads. Cover the jars with the two-piece lids and screw bands tightly. Place the jars on an elevated rack in a giant pot of water on the stove, or in a canner. If you don’t have a rack or canner, you can use extra screw bands or metal cookie cutters and tie them together and use them on the bottom of the pot to elevate your jars. Submerge the jars; the water in the pot must cover the jars by 1 to 2 inches. Add more boiling water if necessary. Cover; bring water to a gentle boil. Let the jars process for 10 minutes in the gently boiling water. Using tongs, remove the jars and place them upright on a towel to cool completely. After the jars cool, check the seals by pressing the middles of the lids with your finger. If the lids spring back, they did not seal properly and you can try again. If you don’t want to try and re-seal, the jam is still perfectly useable, but refrigeration will be required and it won’t have the same shelf life as your properly sealed jars. This method only adds around 4 grams of sugar (from the low sugar juice) per jar of jam you make, so it makes ridiculously low sugar grape jam that tastes deliciously fresh, allowing the natural sugars of the grapes to provide all of the flavor. Alternately you can use 1 cup of water in place of the 1 cup of grape juice to eliminate all added sugar, but the juice gives just a hint of sweetness to keep the grapes from being a bit tart without pouring on cup after cup of granulated sugar. The 1/4 cup of Splenda added in with the pectin is negligible and can be omitted completely if you’d prefer. And there you have it! After the jars cooled and we had checked the seals and found them to be satisfactory, we just let the jars of jam sit, undisturbed, for 12-24 hours. I plan to knit doilies to adorn the jar lids and make pretty little tags for them before we gift them this holiday season. Enjoy, and good luck making jam! 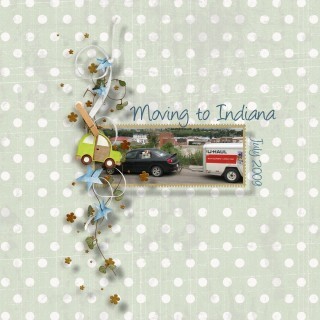 *Gasp* I know, I’m scrapbooking again. Don’t worry — the schnauzer schweater is still a work in progress (and thanks to teaching 2nd grade, it gets forgotten from time to time, ha) and I’ll be knitting some more soon, but I thought a little trip down scrapbook lane would be nice so I could update my Family Life 2009 album a bit. 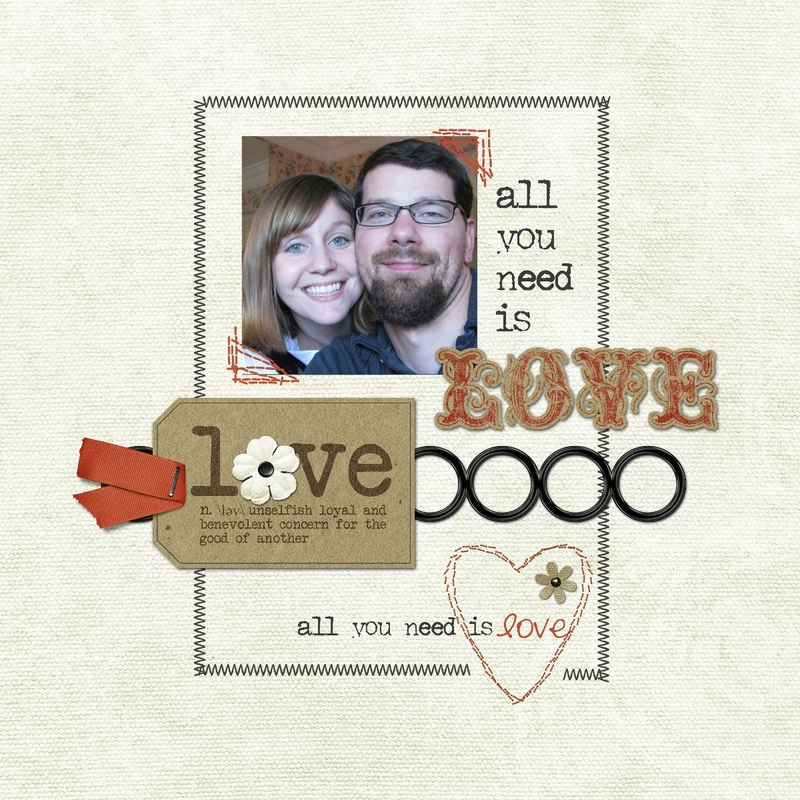 Coming up soon is my sister-in-law’s baby shower that I’m hosting, and I’d love to turn the embellishment I created when designing the invitations into a digital scrapbook quick page layout or mini freebie set to give away. I just wish there was more time in the day! I’ve got two weeks to go, and I’ve still got to design and sew a diaper bag for her, too. A few weeks back we went shopping for fabric and she picked out some adorable quilted fabric and described the type of bag she’s looking for. Now it’s just a matter of sitting down and pulling it all together, which sounds easy but I swear time just seems to get by me. I’ll keep you posted and show off some pics as I get going on it. So that’s it for now! To do list: work on and finish schnauzer sweater, make a little mini kit or quick page of the little boy car embellishment from the baby shower invites, and design and sew a diaper bag! No problem, right? ;) See you soon! P.s. 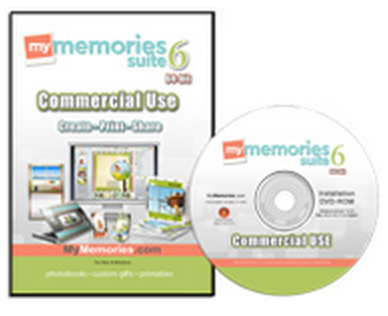 If you’d like to purchase My Memories Suite at 25% off of the original price, let me help you! And don’t forget to check out all of the My Memories Suite tutorials I’ve created to help you get the most out of the software. I had a unique opportunity this week that allowed me to participate in crochet and charity at the same time.Â A friend of mine from high school, Julia Porter, is the Director of Program Expansion for GlamourGals, a non profit organization whose mission is to foster inter-generational relationships between teen girls and elderly women living in senior homes through monthly facials and makeovers. Julia is also a crafty fellow crocheter, and a few months ago she told me about a GlamourGals event coming to Indianapolis and asked if I could come and teach crochet at it. This was a no brainer! 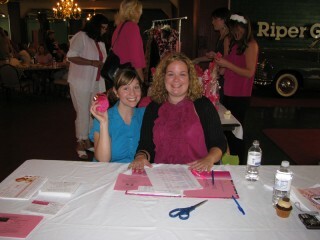 So Thursday night I made a fashionable change by attending and teaching at the Indianapolis Hot Pink Party. The Hot Pink Party is a GlamourGals event that started in New York, where for a small donation/registration fee, you would be taught how to knit or crochet and receive a Lion Brand bag of supplies that would allow you to knit or crochet your very own hot pink scarf, which is a symbol of the awesome that is GlamourGals. The donation goes towards the leadership program for the GG Foundation and you get a night of fun learning a craft with other women also making a fashionable change and you take home a scarf that you made!Â It was a really inspiring and fantastic event, and I taught crochet at a table with a couple of women who had varying levels of experience crocheting, from none at all to moderately experienced. I met a lot of women who have made a difference and who have volunteered their time and dedication to others. 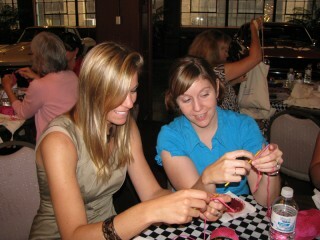 It was so much fun, and I even got the honor of teaching the GlamourGals founder and CEO, Rachel Doyle, how to crochet. 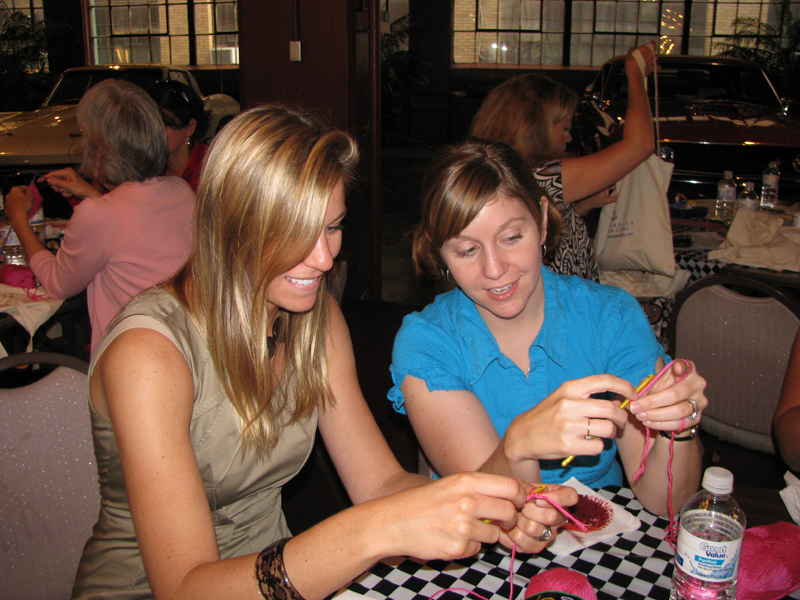 Me teaching the GG Founder and CEO, Rachel Doyle, how to crochet! I strongly urge all of you to take a look at the amazing impact that GlamourGals has made upon communities all over the globe by taking the Hot Pink Pledge. Each donation, no matter the size, goes directly to support the GG Leadership Program which inspires and organizes teen girls around the country, helping them to take part in all of the support GG provides to its senior community of women. YOU, too, can make a difference; make a fashionable change today. For more information, check out the official GlamourGals website and the GG Blog.